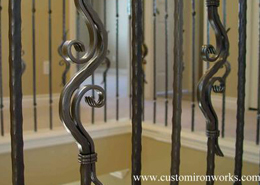 Gallery : Custom Iron Works, Best Stair Railings and Gate Parts on the Net! Over 40 years in the stair components business. 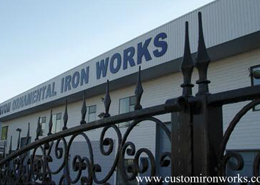 Custom Ornamental Iron Works has had many interesting projects in which our wrought iron, ornamental iron, cast iron, aluminum stair components and accessories were used. If you are seeking ideas, we invite you to browse through these fine examples. 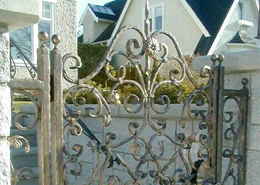 From decorative post caps to ornamental iron railings to totally unique custom designed pieces, if you can imagine it, Custom Iron Works can create it. 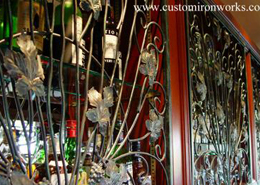 To see how our products have been used, choose the area of your interest and select that Category. Please note we are happy to accept custom projects! Contact us and send us your name, address, type of work you are needing. 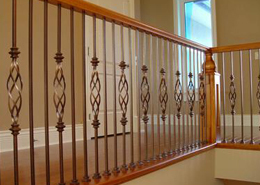 Railings, indoor and outdoor that is our thing! Email us today!